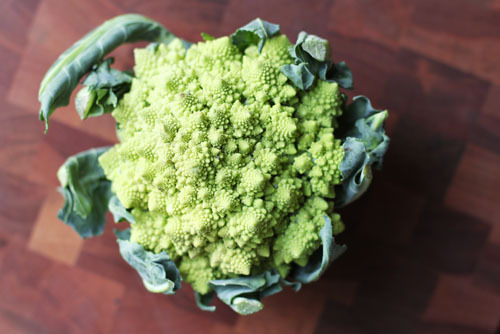 Here’s out latest CSA discovery: romanesco broccoli. Isn’t it cool looking? Both my girls are super excited about it. I think I’ll just roast it like I do cauliflower. Although, it’s kind of a shame to cut the thing up! – Memorial Day! We’ll actually be driving home from a quick trip to Monterey, so probably eating on the road. I know probably none of you are on the computer this weekend, but if you are, please share your menu! And if you aren’t, we’ll see you on Tuesday. Happy Memorial Day, everyone! Have you ever had Japanese sweet potatoes? I didn’t know what they were until they showed up in my CSA bag one week. I mentioned them quickly in a weekly menu post previously, but I would like to talk about them a bit more and share how to make roasted Japanese sweet potatoes, which are pretty much heaven on a plate. 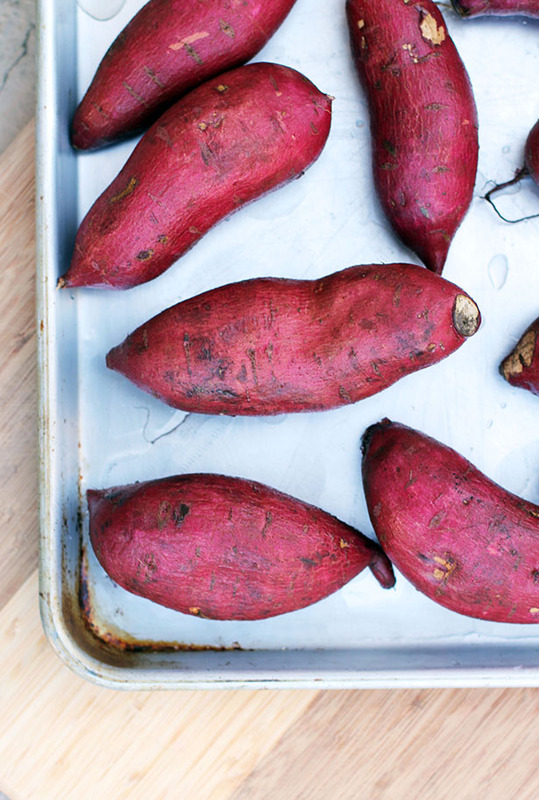 What do you do with Japanese Sweet Potatoes? Once I discovered how delicious Japanese sweet potatoes are, I ordered a whole bunch from my CSA. To preserve them I roasted all of the sweet potatoes at once, placed in freezer bags after they cooled and then stored them in the freezer. I don’t know about you, but one of my major barriers to eating sweet potatoes is remembering to start cooking them early enough to actually have them done by dinnertime. Which is why I’m super excited to have a whole bunch already cooked and ready to go in the freezer. As long as I remember to defrost them when we need them, I think we should be good to go! The process for roasting them is super simple, but I will share the “recipe” below so you can replicate how we cooked them (and so I can remember what I did myself!). Seriously, if you ever see these at your market, grab a few and give them a try. Nate and I really love them, but they are kind of hard to find. Wash Japanese sweet potatoes then poke them with a fork in several places. 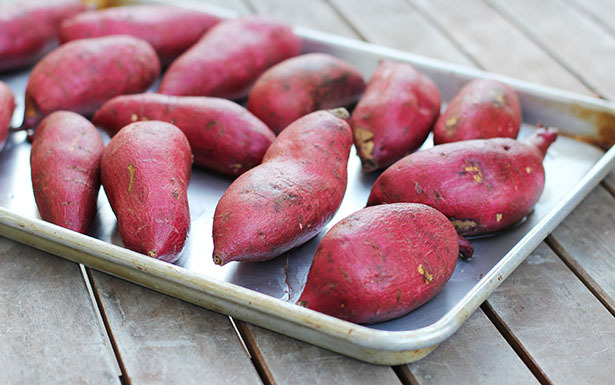 Place prepared sweet potatoes on a rimmed cookie sheet or roasting pan. place on a cookie sheet or roasting pan. Cook for approximately 1 hour, until knife pierces sweet potatoes easily. Cut open, drizzle with butter (or olive oil or coconut oil if you want to keep things vegan and dairy free! ), salt and pepper and enjoy! Where have you been all my life, Scoop? Remember the kitchen disaster story contest? Remember how I came in second and didn’t win the $3500 Pampered Chef shopping spree? In all honesty, I was totally fine with not winning. I loved reading all of your fantastic disaster stories and my life is just as happy with or without oodles of kitchen gadgets floating around my house. However, there was one item that I was intent on using my winnings to purchase. When I didn’t win, that one item came immediately to mind. I begged The Pampered Chef people to hook me up with this item. Which they did. They’re nice like that. So, what is this item I was dying to get my hands on? A scoop. 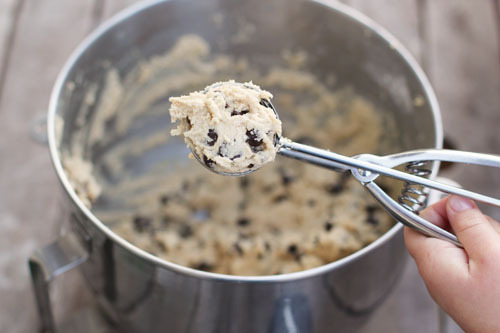 For scooping cookie dough. I’ve wanted one for years and, for whatever reason, just never got one. The Pampered Chef folks were kind enough to send me their medium and large scoops. Well, I finally used both of them for the first time this week. And, can I say, I don’t know how I lived without them!!! The medium scoop was PERFECT for cookies. It was so easy to bang out cookie dough ball after cookie dough ball, all perfectly shaped, all exactly the same size. Why has no one insisted I get one before now? This scoop seriously rocks my cookie world. The large scoop is pretty big, so I wasn’t entirely sure I would use it that often. I rarely make giant cookies. But then, this past Sunday, as I was making pancakes and dribbling batter all over the pan off the back of my 1 cup measuring cup that I always use to pour the batter with (that was a mouthful! ), I thought about that large scoop. I pulled it out and…yup…it worked like a charm. The batter poured into the pan so nicely and all the pancakes were the same size. I love it! So, if you don’t have a scoop yet, get one. Or two. Because you need a smaller one and a bigger one. Life will never be the same! Update 7/2014: I wrote an addendum to this post to specify that the Pampered Chef post is actually pretty awesome quality to other scoops we’ve tried. Click here for more info! Another Sunday, another menu. Where does the time go? When Nate realized this week that we’re over halfway through the pregnancy (23 weeks today, in fact), I think he almost fainted. Before I know it we’re going to be sitting in our rockers on the front porch with great-grandchildren running around our feet! This is another photo from the many I took at Cafe Borrone on Friday. 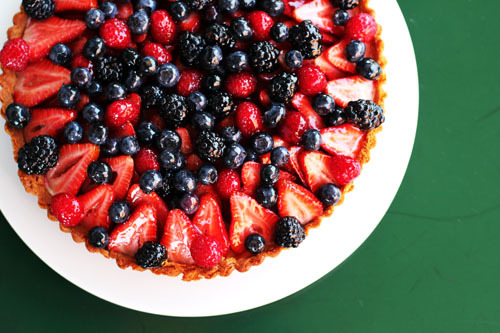 Couldn’t you just dive into those berries?! Summer is coming – yea!! – Breakfast for dinner! 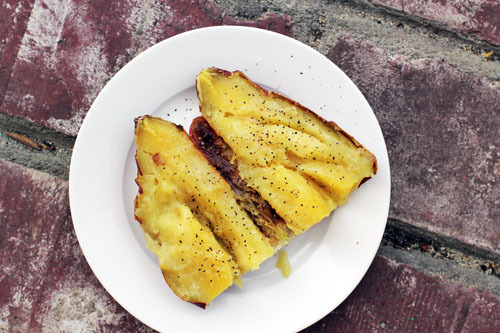 I have an idea for stuffed french toast that I’m going to experiment with…will report back on that next week! Time to share your illustrious menus. Or non-illustrious. I’m not picky. ALSO…sorry I didn’t respond to any of your comments or menus last week, I woke up with the flu on Monday. I was completely useless for a few days. But we’re back to normal this week! I’ve been doing some photography work for Cafe Borrone the last few months. We had another shoot this morning, which means I ended up coming home with the best lunch ever. Happy Friday to me! 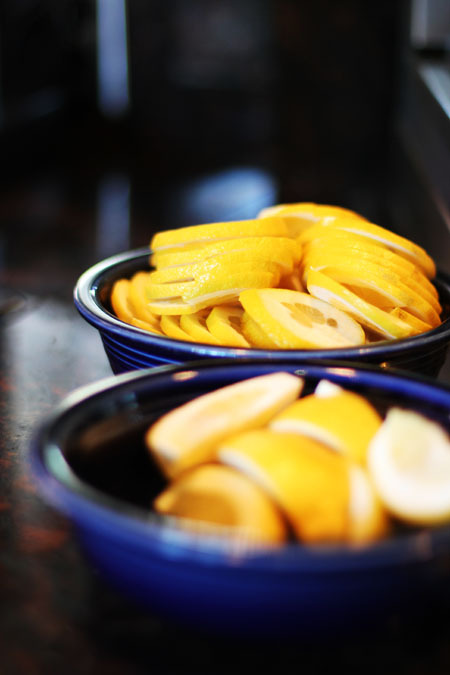 While I was waiting for Josh (the head chef) to set up a shot of the beer on tap, I noticed these lemon slices off to the side. I snapped them quickly and am in love with the shot. I don’t know why, this photo just pulls me in. 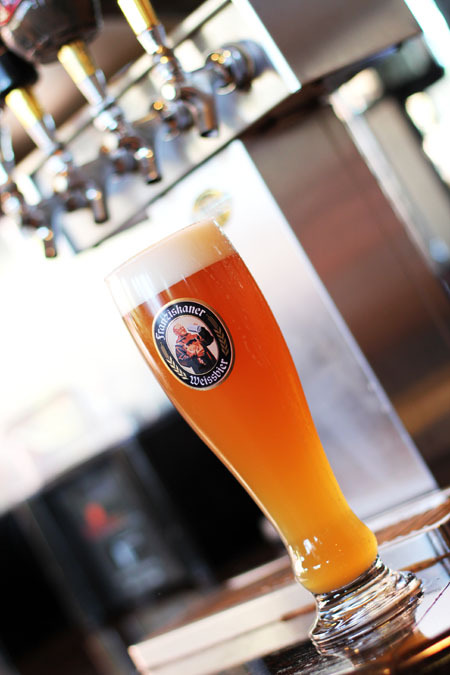 And, here’s that beer I was talking about. I figured I should share, it is the weekend after all. I have to say, shooting food that I don’t have to prepare AND that I get to eat afterwards is the best. Relaxing, fun, delicious. Speaking of delicious, I’m going to go finish my lunch. Which, by the way, does not involve any beer. 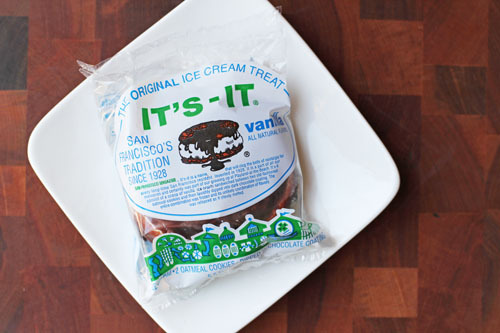 When we first moved to the Bay Area, one of Nate’s co-workers told him about It’s-It Ice Cream. We tasted the mint flavor and, in all honesty, weren’t that in love. Then, the other day, they were sampling the original vanilla flavor at Costco. My girls of course begged for some, so I gave them each a sample. I was going to pass on it myself, but decided I may as well give it another try. After one bite, I threw a box in the cart to take home! I did a little research about It’s-It Ice Cream before sitting down to write this post. It’s-It has a very fun and unique-to-the-Bay-Area history, which you can read about on their website. It’s-It Ice Cream even has an entry on Wikipedia. This ice cream must be serious business! I love that it’s been around forever and is so tied to the local culture. It’s fun to eat something and know people nearly 100 years ago ate the same thing. It’s-It is simply vanilla ice cream sandwiched between two oatmeal cookies (with tiny raisins…we didn’t even notice those until last night!) and dipped in dark chocolate. They have a few other flavors, and you can find them throughout the West or order online. And I love their retro packaging. As I was munching on my It’s-It last night, I couldn’t help but think of other similar ice cream creations in other parts of the country, creations that people stand by for years, creations tied to the history of a place. Newport Beach has its Newport bars and chocolate dipped frozen bananas. North Scituate, MA has it’s Wilbur Wheels. Cape Cod simply has homemade ice cream everywhere you turn, each town on the Cape claiming theirs is the best. 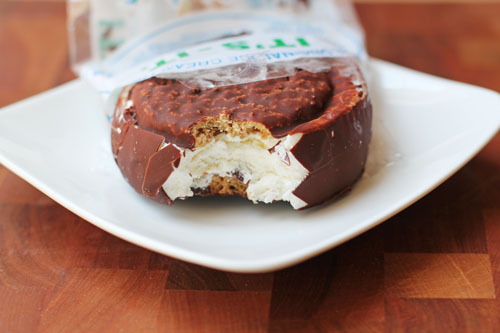 What is it about ice cream that inspires such tradition, loyalty, nostalgia? The possibilities for creating new frozen treats are endless, so everyone can find their own claim to fame. And maybe ice cream just tastes so good we can’t help but keep coming back for more. As always, I love hearing about where you live and your own traditions. Share your town’s/region’s/state’s favorite ice cream treat! And who knows, maybe one day I’ll get to try them all…one can wish! “Plate to Pixel” Giveaway Winners! 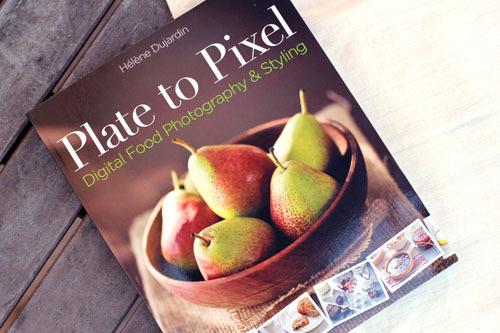 Time to announce randomly-selected winners of the Plate to Pixel giveaway! Drumroll please…go ahead, tap your fingers on your desk…it builds the suspense. Congratulations, everyone! I’m certain you will all love the book! I have fond memories of time with Grammy and Grampy. Sure enough, the other morning as I was re-heating a few for our breakfast, I was immediately transported to Grammy’s kitchen. Cate constantly begs to eat more muffins. And when I say constantly, I mean CONSTANTLY. The girl is obsessed. And rightly so. They are darn good! So, here you are everyone, Grammy’s treasured Blueberry Muffins. Enjoy! Mix flour, sugar, baking powder and salt together. 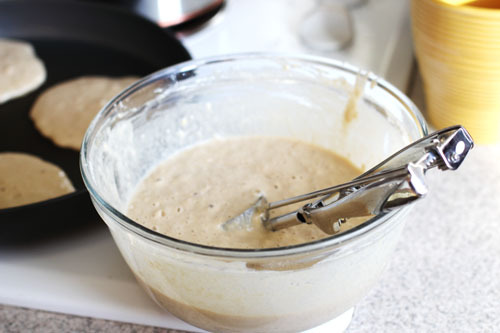 Work in the butter with a fork or pastry blender until well mixed. Whisk egg and milk together in separate bowl, then add to dry ingredients. Carefully fold in blueberries. Sprinkle tops with sugar. Bake at 400 degrees for 20-25 mins. Makes appx. 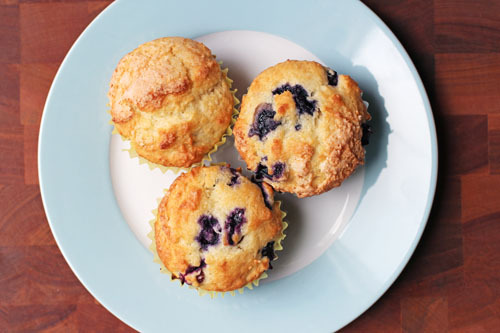 8-9 standard-sized muffins. 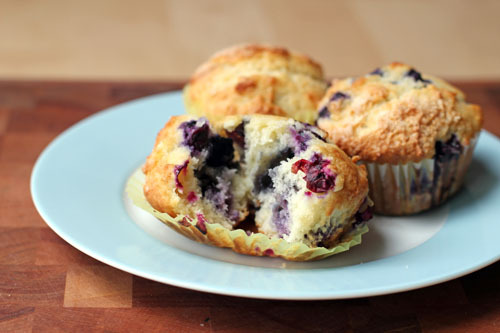 To reheat muffins the next day, but in a low oven (200 – 250 degrees) for 10-15 minutes or so. 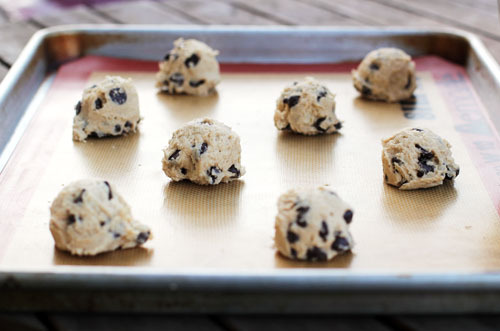 Take them right back to that perfect straight-out-of-the-oven moment. If you’re pressed for time, heat in the microwave for 10-15 seconds, then put in the toaster oven for a few minutes to “crisp” the outside up a bit. Good Morning! 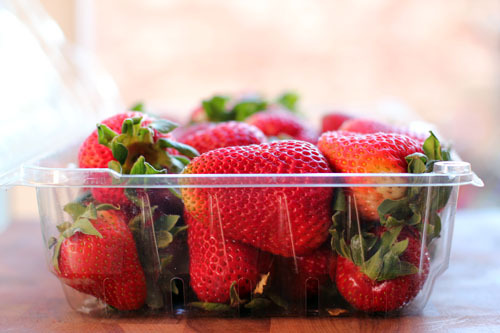 How about some fresh fruit to start the day? Your turn! Bring one the menus, plain or fancy we want to see them all! Leftover Boiled Potato Problem Solved! I know that leftover boiled potatoes is not a frequent problem for most of us. It isn’t for me. But I’m writing this post anyway because I’m feeling all proud and stuff. Occasionally I end up with leftover boiled red potatoes sitting in my fridge. We always have them with Swedish Meatballs (whether homemade or from the Ikea freezer section), and I almost always end up cooking more than we end up eating. We had Swedish meatballs last weekend (the Ikea variety) and have had about 8 boiled red potatoes sadly sitting in our refrigerator ever since. They just wanted to be eaten, but I honestly didn’t have anything to eat them with! Then today a lightbulb finally went off in my head. Home fries! 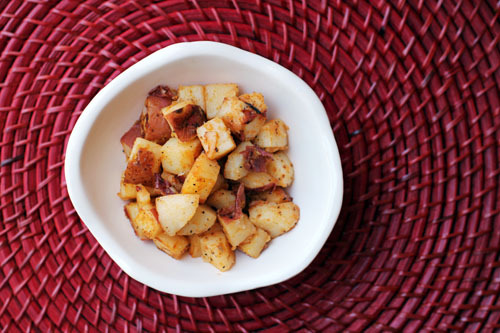 I quickly cut the cold, boiled potatoes up into chunks and within minutes we had perfectly cooked home fries. Anna and I ate them alongside french toast made with stale bread. I was feeling quite resourceful…and our bellies were very happy! Plus, they cooked so fast. It was fabulous! Pour a bit of olive oil into a skillet over medium to medium-high heat. 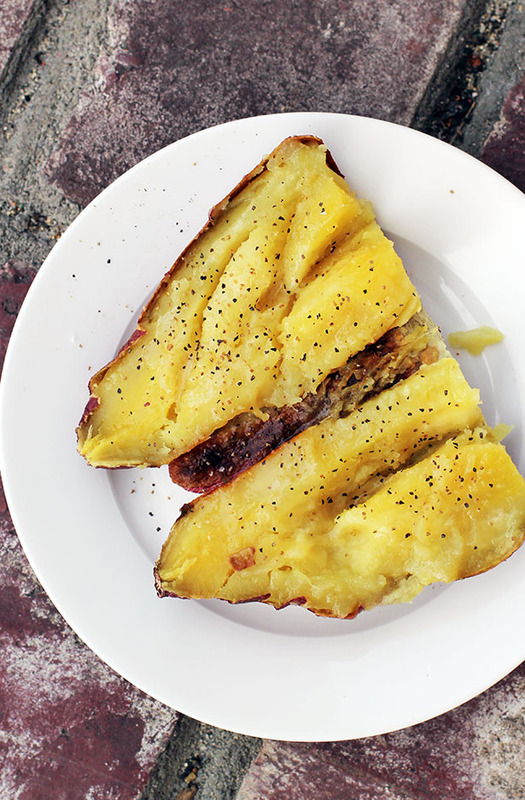 When skillet is hot, add potatoes. Sprinkle evenly with salt and pepper, then evenly with a bit less paprika and garlic powder. Cook until heated through, less than 5 minutes. Stir occasionally during cooking time. 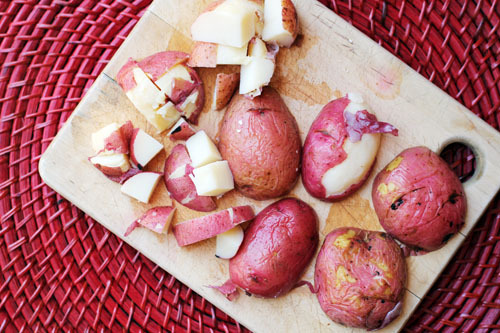 One more thing…I know most of you are still waiting for Spring to arrive, and I feel a tinge of guilt whenever I mention my CSA, but I just have to say this: the red potatoes we receive from our CSA taste way better than the ones I used to by at the store. Another 10 points for joining a CSA!